On a recent rainy day, I got a wild hair to research film novelizations from dark and gothic films of my youth. I thought it might be really fun to put on one of the movies in the background, make a big pot of blackcurrant tea, and read through the film novelization. I was really hoping to find the novelization for "The Craft," but no luck so far! 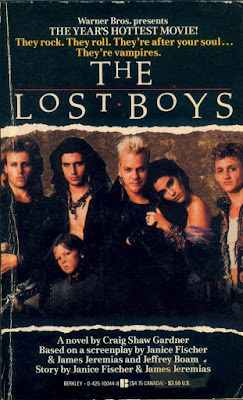 The Lost Boys, by Craig Shaw Gardner. This author has written a lot of film novelizations, including one for Tim Burton's "Batman," so this is probably well written. 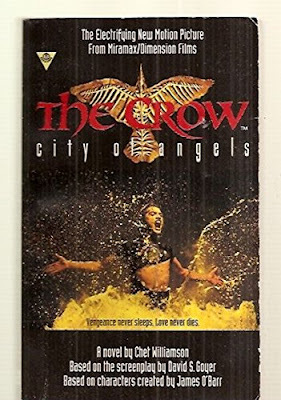 The Crow: City of Angels, by Chet Williamson. Chet Williamson also wrote The Crow: Clash By Night. I was disappointed to not be able to find the novelization for the first film - I know I could go read the comic, but I prefer to read text, not look at pictures. Bram Stoker's Dracula, by Fred Saberhagen. Saberhagen wrote many Dracula-themed and vampire-themed books, so he was perfect to write this novelization. I wonder if I could read it all the way through without remembering Winona Ryder's awful voice in this film and Keanu Reeves' horrid accent!